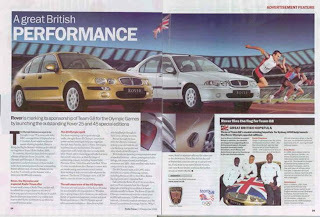 Rover sponsored Team GB at the 2000 Sydney Olympics. Special edition cars were produced and painted gold, silver and bronze. 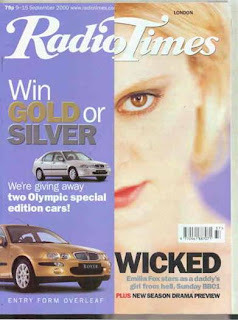 In order to promote Rover's association with the team, and the special editions, we brokered one of the first cross-platform deals and used the Radio Times portfolio for 6 weeks in September / October 2000. 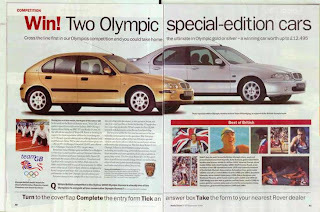 The package of activity included a 'win a car' competition on a detachable front cover flap, a marketing DPS to promote this, a DPS advertorial, ad pages, strips on TV listings and a web reprise that included competition fulfilment. 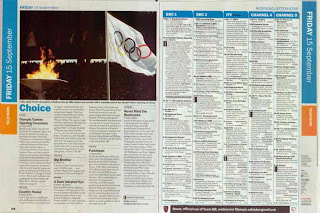 There were 18,000 entries to the competition and remarkably (given how young the internet was) over half of these entries came through the competition website!